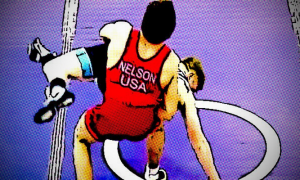 WBC's Chris Allen Talks Returning to Greco & "Sharpening the Ax"
So much of the conversation surrounding United States Greco-Roman wrestling is centered around youth. We need ’em young, we need to get them started as early as possible. It’s a fair narrative. 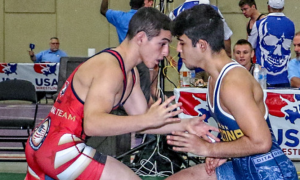 There is certainly a substantial pile of evidence suggesting that American Greco would benefit a whole lot more if the country’s program could assimilate more younguns into the fold. For crying out loud, a 16-year-old devoting his athletic livelihood to the style wouldn’t even be considered keeping pace with the rest of the world, since everyone everywhere else, down below and high above, only subscribe to the international disciplines. But you knew this already. Then what do you have to say to a guy like Chris Allen (55 kg, Williams Baptist College)? Allen, 21, was once a promising age-group competitor who even had the chance to represent the ol’ stars and stripes at the Cadet Pan Ams half a decade ago. 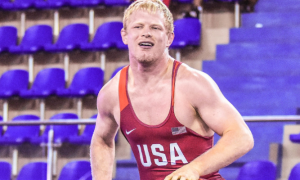 Coached in high school by now-USA Greco-Roman Operations Manager Gary Mayabb, the Missouri-bred Allen had all the appearances of a future Junior and Senior World Team candidate — until he didn’t. That’s because upon graduation, instead of moving on into collegiate folkstyle or even better, Greco at a place like Northern Michigan, he grabbed a self-imposed time out. Yeah, he caught on as a coach and sure, he became a valuable workout partner for a guy or two or three, but it’s not the same. At only 19 years of age, it was like the oddest kind of wash out. Here was a wrestler coaches deemed to be a legitimately capable prospect with a very high ceiling, but it was Allen who wanted to reassess his own standing in the sport. The mood began shifting after a couple flips of the calendar, however. It’s difficult enough to say goodbye to a past you once loved, but it is a whole ‘nother challenge to prepare death’s warm embrace for a future you never even had. Which is what leads us to where Allen is today. And most importantly, why. Williams Baptist College adding a full-time Greco-Roman team to its athletic department last year did not singularly lure Allen back into competition, though it certainly helped. It’s just he had witnessed the glimmer reappearing in his eye before that news came down. The timing, it couldn’t have been much better. Allen had matured, he learned what the cost was, and the bill paid for a fruitful career not realized resulted in a bounced check. 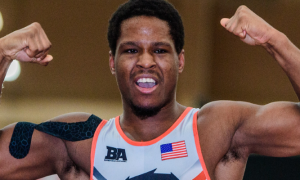 He had the opportunity to train with 2015 US National Team member Brian Graham (66 kg, Minnesota Storm) as Graham was preparing for April’s World Team Trials — perhaps the preeminent turning point in all of this. 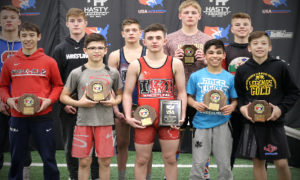 As the spring eased into the summer — and after visiting Walnut Creek, Arkansas — it became official: Allen was once again a student-athlete, and like the rest of them in the WBC practice room, will go down in history as part of the school’s first-ever Greco-Roman team. Pretty neat. What’s even neater, is that Allen isn’t there to just pound it out and hope for the best. There are some lessons he needs to relearn probably, some tests of will and might he is supposed to endure for one reason or another. But he’s skilled, motivated, confident, and grateful for this second act, particularly because he seems aware of its uniqueness. So…what do you say to a guy like Chris Allen? 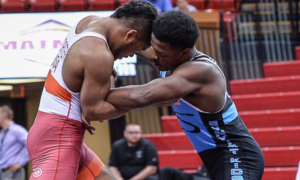 5PM: You’re one of several athletes on the WBC squad who had relevant Greco experience coming in, but you didn’t pursue the sport right away after high school. What’s the journey here, what exactly happened? Chris Allen: It started in high school with my coach, Gary Mayabb. He got me into Greco, he was a big influence, so it has always been important (to me) since then. But after high school, I wasn’t sure I wanted to continue on. I took a few community college classes and then I got the itch to compete again. I’m 21-years-old, so it’s never too late. I found out about Williams, got in touch with Coach (Kerry) Regner, and the rest is history. 5PM: Not only is 21 never too late, but I’m almost wondering if now is a better time than it would have been a few years ago in so far as understanding what your drive is, what your goals are, and also, there is now a greater amount of maturity. Does that sound accurate? CA: 100%, definitely. While I wasn’t competing during that little gap, I was coaching, and that helped me learn the sport in a different way. I absorbed that into my own wrestling, I could see the little things that needed to be worked on. 5PM: What have you paid attention to the most about the sport over the last few years? That could be domestically, internationally, the rules, but what it is that has sort of captured your attention the most about Greco before you came back? CA: I’ve definitely been keeping up domestically, especially with the lighter guys and 55 kilos being brought back, like Max Nowry and those guys are a big influence on me. Spenser Mango, Ildar (Hafizov), those guys. Watching the World Championships and all of those European countries that are finding success, I watch film and see what they’re doing that we as Americans aren’t, and then try to implement those things in the practice room to learn from their success. 5PM: Is that something you enjoy doing, do you like to watch a lot of international competitions? Chris Allen: Oh yeah, I’m a film guy. I’ll watch and study. I was just watching an old YouTube video from the Soviet Union, back when it was still the USSR. I saw a little arm throw-type thing and I was like, Hey, I can do that. So I started working on it in practice and added that to my repertoire just by watching film. 5PM: Hopefully you live to be 145 years old, should you live that long, the couple-of-years gap you have between high school and Williams will seem even less significant. It doesn’t mean all that much right now, anyway. But as a Cadet age-group competitor, that’s a different style than Senior Greco is. Now that you’re a Senior, what have these differences meant to you and what kind of adjustments have you had to make that you might not have expected? CA: It’s just a lot more, like I said earlier, more physical, more brawling. Whereas in the Cadet and Junior age groups, there is more leniency. Guys don’t want to stay in there and fight ties or bang with you. But here, that is going to be every match at the Senior level, at the international level. Nobody is just going to back down to you. 5PM: What comes first for you, personally, in regards to training right now? What are you most concerned with, are you trying to take a more physical approach in the room, are you focusing a lot on getting your technique clean, or is it a combination of the two? Do you feel like you’re playing catch-up? CA: I was lucky enough to have Coach Mayabb, he was very technical, he’s a technical mind in the sport of Greco-Roman wrestling, so I already had most of the technique coming in. So now, like you said, it’s a matter of just brawling, and finding those opportunities to score whenever it’s in the heat of the moment. Like, it doesn’t have to be perfect. 5PM: That is a very poignant thing to say because if there is one criticism American wrestlers get, it’s that they won’t go for techniques unless everything is perfect, the setup, the transition, the position. A lot of Europeans don’t necessarily feel they have to be in perfect position to try and throw, is that what you’re talking about? CA: Yeah, if you’re waiting for the perfect opportunity, it’s never going to be 100% perfect. When you’re drilling, you are letting the guy, so to speak, get into that position and you’re not fighting him 100%. But in a live match, in a live situation, it’s never going to be perfect. So it’s learning how to throw, because even if it does go bad, learn how to wrestle out of that position and score on the backside of that. 5PM: What was it about Williams that was your primary attraction? Chris Allen: Well, when I went on my visit, at first I was kind of like, Why am I going here? But it’s not too far from home, so that was a big thing, I’m close to family in case something happened. And it’s just a good training environment. All of the guys there had the same mindset. Even though we are the new program, it’s not like we are the “new” program. Everyone has that mindset of, I want to make a World Team, I want to win an Olympic medal. Being around a lot of like-minded individuals was a big drawing point. Before I decided to come to Williams, I was training back home with Brian Graham and we had a similar schedule. We weren’t going as early in the morning, but we would usually work out once at like ten and then again at like 4:30 or 5:00. It was just as intense, but it was only us two. Then he was training up at (Minnesota) Storm for awhile, so he brought some of that Storm technique and showed a little of that to me, and I think that is when I made the biggest jump before coming to Williams, training with Graham. It was almost like my catalyst to push me over the edge to want to buy into the program and continue my Greco career. 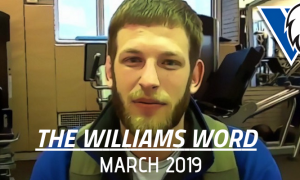 5PM: Another thing that sets Williams apart, aside from being the only other collegiate Greco program in the US, is that it is a Christian school. It is a faith-based institution. How did that factor into your decision to attend? CA: At first, I was kind of indifferent about it because I’m a very spiritual person, but not necessarily the most religious person ever. But definitely, being here has opened the doors and made me think about a lot of stuff more, and grown closer in my faith by being here. Looking back, it was a good opportunity. I’m glad they are how they are. 5PM: How does your routine at WBC present itself? What does a typical day or week in the life of Chris Allen currently look like? CA: Monday, we start the morning off with a 5:45 lift. After that, go to class and then at 4:30 is an on-the-mat practice, which on some days is technique and the next week is more live. It just kind of depends. Tuesdays, we have two on-the-mat sessions — one at 5:45 and another at 2:30. Wednesday is another lift, and that is more like a cross-training, circuit-training type workout. That’s at 5:45 and we have the rest of the day off to recover, take ice baths, foam roll, stretch, and basically just get whatever you need. Everybody is different. Me personally, I’ll take an ice bath, foam roll, and stretch for at least a half hour. Thursdays, we have a 5:45am on-the-mat session and then another at 2:30. Fridays are just a lift at 3:00. Saturdays is another cross-training, partner-lift-buddy-carry type of workout at 8:00 in the morning. 5PM: How has this training regiment worked for you thus far? For instance, are you seeing its benefits play out going live and things like that? Chris Allen: Oh yeah, definitely, especially the circuit-training workouts, they are more Crossfit type stuff. The cardio is helping a lot. And with the weight room, the program we are doing is helping build a lot of strength. 5PM: You got back out there a month ago at the Midland Greco Exhibition Series in Nebraska, which was a vast event showcasing some Senior talents, a lot of age-group talent, and it was a great opportunity to get a lot of matches in a non-pressurized kind of atmosphere, though that probably isn’t how it is once the whistle blows. Did you have a lot of butterflies pre-competition? CA: I wouldn’t say a lot. I mean, definitely, I get nervous before, because if you don’t get nervous then really, what’s the point? If you’re not nervous, then it means you don’t really care about it. You should have some kind of feeling in the pit of your stomach. But I am a big reader and one of the books I’ve been reading is The New Toughness Training For Sports by James Loehr, and one of its biggest things is not letting the pressure get to you. You can spend all of this time worrying about what can go wrong, but that is paying off a debt you haven’t even incurred yet. It’s just wasted energy. So I like to take a couple of deep breaths, relax before a match, and then go out there and give it all I got. 5PM: You went 2-2 in Nebraska. What about your performance surprised you and was there anything about your ability to compete that you were happy to rediscover? CA: It was just good to get out there. It had been two years since I was last on the mat, so it was nice to kind of shake the rust off, shake the cobwebs off, and get out there again. But as soon as the whistle blows, it’s like riding a bike, it’s the same old battle. I think I hand-fought really well, I had good position, but it was just a matter of, like we were talking about earlier, I didn’t have that grit and I wasn’t battling for every inch, every centimeter. I was kind of complacent. But I’d say the biggest thing I think I needed to work on personally was par terre, stopping lifts and moving on bottom. I think I was stopping myself, and that’s when the Senior guys, domestically and internationally, that is when you’re going to get lifted, gutted, and bad things are going to happen. 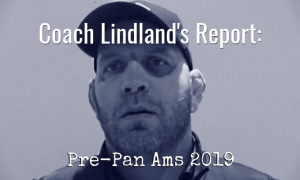 5PM: What did Coach (Jonathan) Drendel tell you after the event? CA: He pretty much said the same thing, that we have to do more work on bottom, but, You hand-fought well and that you need to get to your attacks, your stuff, and to not let the match come to you, you have to go and get it. 5PM: There will have been a sizable stretch of time between when you last competed and the next time you compete. How are you seeing these upcoming months? Are you happy with this block of time so you can keep building on the foundation, or do you wish you could get out there a little sooner? CA: Yes and no, as bad of an answer as that is (laughs). Yes, because it gives me time to work on the weaknesses that we found out in Nebraska. But also, no, because I am in a little different boat than some of the other guys on the team because they had either just come off of a college season last year competing or high school season competing, whereas I haven’t competed in a couple of years. So personally, I think I need more matches, more opportunities to compete to test myself that way, since it has been a little while. But it is also nice to sharpen the ax, so to speak. One of my favorite quotes is from Abraham Lincoln, if it takes spend five, six hours chopping down a tree, I’m going to spend the first four hours sharpening the ax. 5PM: Are you looking at this all as the beginning of a long, decorated career as a Senior international athlete? Or are you taking it step-by-step and seeing how it goes on a progressive basis? What is the journey you’re envisioning for yourself going forward? Chris Allen: I definitely think, like you said, it’s going to be a process and it is going to be long, but it is one that I am ready and committed for, to have longevity and success in the sport. I am fully willing to make all of the sacrifices and do whatever it takes to be successful. But success to me, yes, it’s nice to get medals and win tournaments, but setting up the future generations for Greco-Roman wrestling in the United States is also one of the ultimate goals. When I am done competing, I definitely want to get into coaching and start up those kids in Greco early and have my own club, grooming those kids for Greco success. Follow Chris Allen on Twitter and Instagram to keep up with his career and competitive schedule.